If you are looking for a great introductory article on Log4Net, I would recommend reading the Log4Net tutorial by Tim Corey. Tim goes through quite a bit, I just want to cover the very bare minimum for getting log4net to work in a console application. 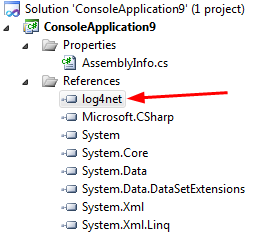 Using NuGet this is really easy – but no matter how you do it, you should end up with a reference to log4net in your project. To create an instance of a logger, there are a couple of ways you can do this…. Simply run the application and you should see log file being created. Great simple write up. Thanks a lot. Awesome tutorial. Great job(simple and step by step). I followed this settings but the stream goes to the console and not creating the file. This is one of the example is working. Thanks a lot!!! Great and simple example! @ravikumar it's because the configuration is not saved in the executable. ..after spending on several posts.. this is godsend for me. When I run the code, I can see the logs in console but It doesnot generate logfile... I need a separate file for logs. Please help me.